Abstract: Studies of the relationship between the EU and NATO often focus on the limitations of cooperation, be it at the political or the operational level. 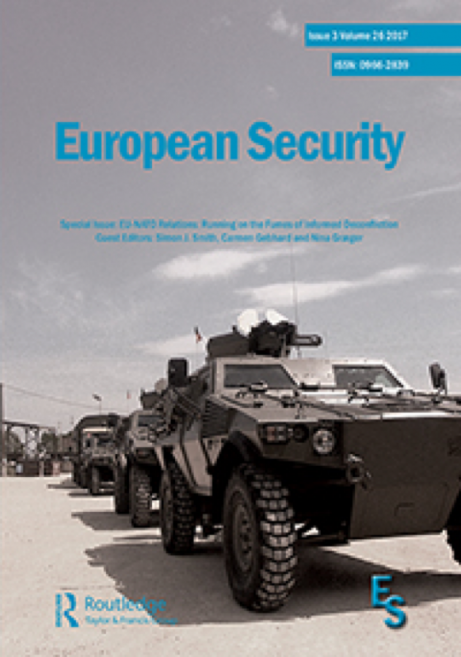 However, little is known about the functioning of the political institutional linkages between the EU and NATO. This article therefore studies the main decision-making bodies of the two organisations at the political, ambassadorial level, namely the Political and Security Committee (PSC) of the EU and the North Atlantic Council (NAC) in NATO, as well as their joint meetings. The article employs an inductive Grounded Theory approach, drawing on open-ended interviews with PSC and NAC ambassadors, which reveal direct insights from the objects of analysis. The findings emphasise the impact of both structural and more agency-related categories on decision-making in these three fora. The article thus addresses both the paucity of study on these bodies more broadly and the complete lacuna on joint PSC–NAC meetings specifically, warranting the inductive approach this article endorses.